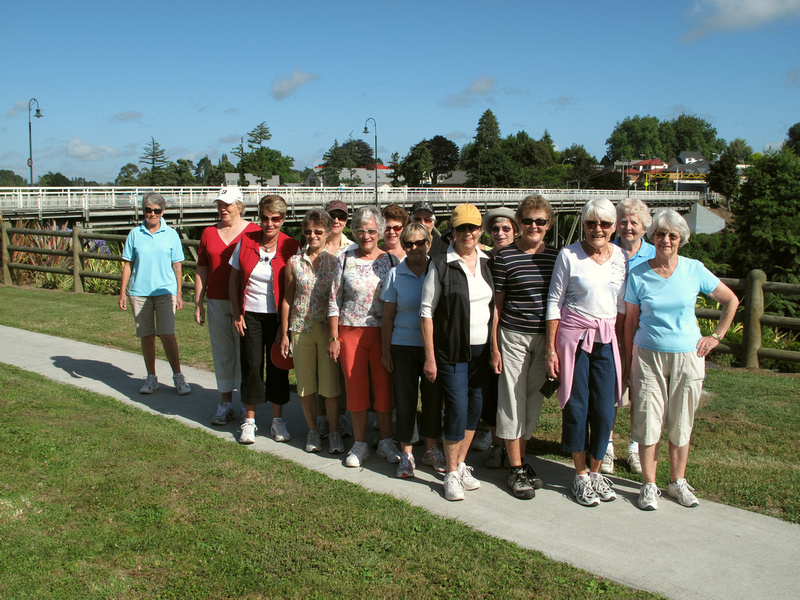 The Tuesday walking group pause in Cook Street, Leamington, New Zealand this morning the 12th of January 2010 for a photograph. 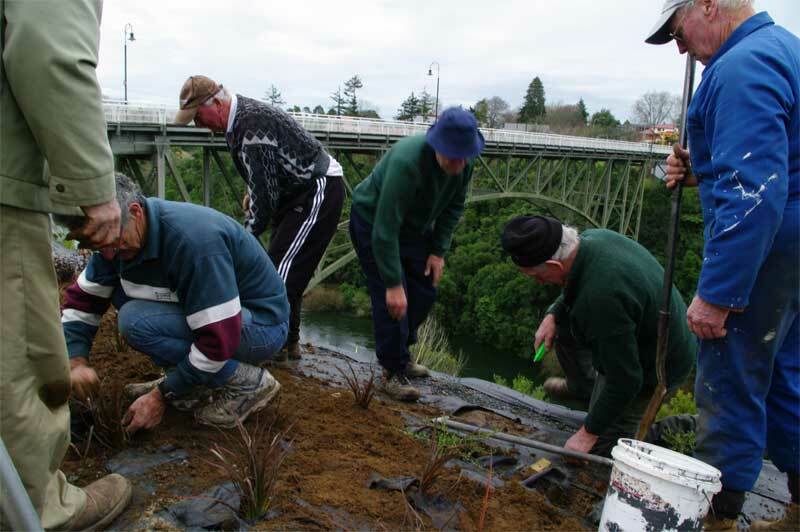 Behind them is Victoria Bridge (they have just crossed it from Cambridge beyond) which has spanned the Waikato River for 100 years. This walking group – there are others – has been in existence for twelve years. 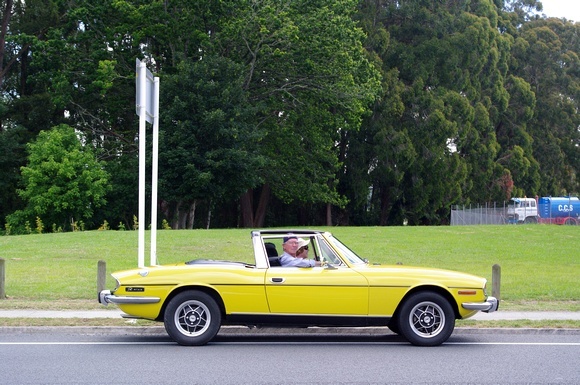 Back to Cook Street where I saw the Triumph Stags this morning. 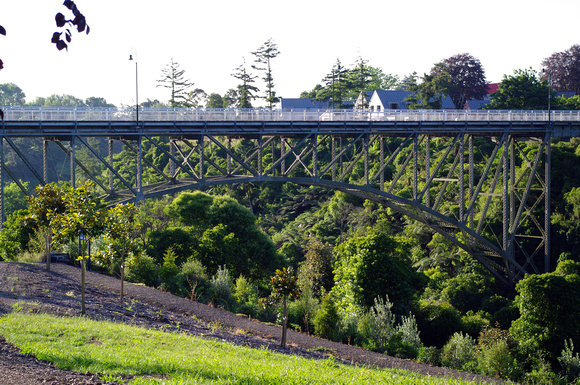 Cook Street is all of 200-300 metres long – a brief interlude between roundabouts – and runs alongside the Waikato River. It’s uniqueness – it links traffic from the east – Tauranga and the Bay of Plenty with the west – New Plymouth and Taranaki. There are other routes – this is ours. 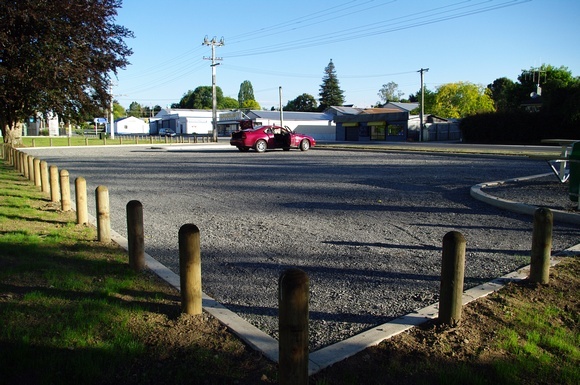 A new riverside parking area has appeared in the past couple of weeks, complete with picnic table. The view isn’t too bad either. Peeking above Victoria Bridge the somber roof lines of Le Quesnoy Place over in Cambridge. Across the road in surprising minimalist livery – black with modest yellow trim and signage – chalk on black board – the Pie and Espresso café. Which was until recently The Kiwi Pie Café. On my way to the Christmas Parade I found a line of 13 or 14 Triumph Stags on Cook Street. I didn’t have the presence of mind to ask them where they were going – I was thinking of other things. And I did not notice the customisations until editing – yes, I know it’s an illusion – but amusing all the same. I couldn’t have set it up. There are a couple more shots of these beautiful objects in today’s gallery. By the way when did Pies & Espresso become black? Now I don’t want you to get the idea that this is just a bloke thing. The ladies were out in force as well. This is the Cambridge Tree Trust Tuesday Team. The weed mat was placed by the council the plant material raised by the Tree Trust itself.